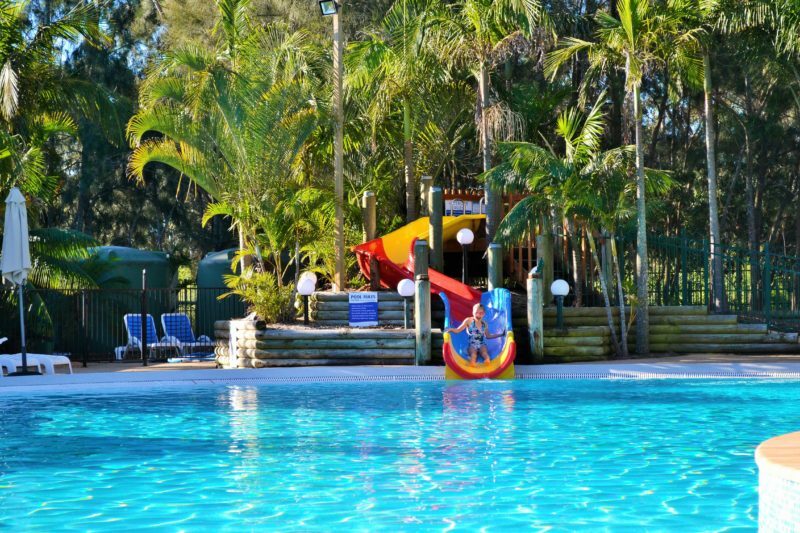 NRMA Ocean Beach Holiday Resort boasts a huge range of features for all to enjoy included heated resort pools and spas, waterpark, playground, go-karts and kids’ activities. Or, sit back at the café, camp kitchen or one of many barbecue areas. 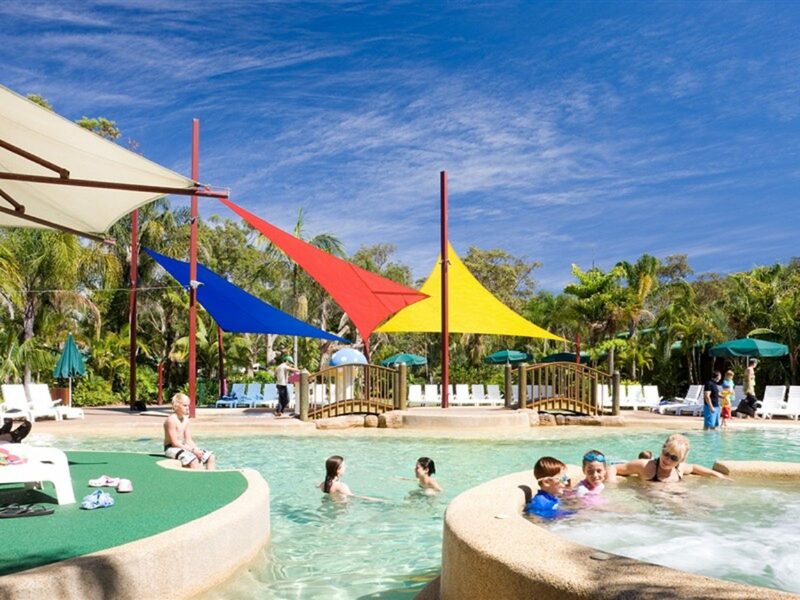 The stunning Central Coast offers an array of attractions including Somersby Falls in Brisbane Water National Park and Australian Walkabout Wildlife Park. 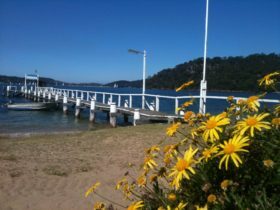 Or head to their backyard – Umina Beach – the perfect spot for surfing, fishing and scuba diving, or, simply relaxing on the beach. Located overlooking the ocean and close to facilities including amenities, waterpark and barbecue facilities. Two queens and two single bunks. Features air-conditioning; heating; full kitchen with stovetop, convection microwave, fridge and dishwasher; lounge and dining area; television, Foxtel (limited channels) and DVD; two bathrooms; washing machine; veranda with outdoor furniture and dining area. Garden view from villa. One queen, one single bunk and one single bunk with top bed only. Features air-conditioning; heating; full kitchen with stovetop, oven, microwave and fridge; lounge and dining area; television, Foxtel (limited channels) and DVD; bathroom with bath; veranda with outdoor dining area. Family villa located close to resort facilities. One queen and two singles. Features air-conditioning; heating; full kitchen with stovetop, oven, microwave and fridge; lounge and dining; television, Foxtel (limited channels) and DVD; bathroom; washing machine and dryer; veranda with outdoor dining area. Cottage located overlooking the garden and situated close to resort facilities. One queen, one single bunk and one single bunk with top bed only. 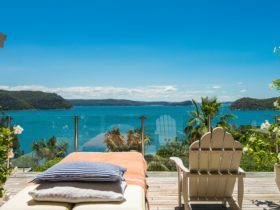 Features air-conditioning; heating; full kitchen with stovetop, convection microwave, fridge and dishwasher; lounge and dining; television, Foxtel (limited channels) and DVD; bathroom; veranda with outdoor dining area. A garden view cabin, located close to resort facilities. One queen and two single bunks. Features air-conditioning; heating; full kitchen with stovetop, oven, microwave and fridge; lounge and dining; television, Foxtel (limited channels) and DVD; bathroom with bath; veranda with outdoor dining area. Garden view cottage, located close to resort facilities. One queen and two single bunks, television in main bedroom. Features air-conditioning; kitchen with stovetop, convection microwave and fridge; lounge and dining; TV, Foxtel (limited channels) and DVD; bathroom with half bath; veranda with outdoor dining. .
Garden view cottage, located close to resort facilities. One queen and two single bunks. Features full kitchen with stovetop, convection microwave and fridge; lounge and dining; television, Foxtel (limited channels) and DVD; bathroom; veranda with outdoor dining area. Located overlooking the garden and close to barbecue facilities. Open plan. One queen and two singles. 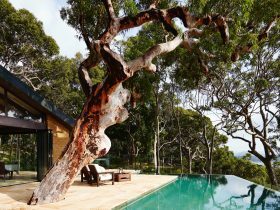 Features air-conditioning; heating; kitchenette including fridge and microwave; lounge and dining; television, Foxtel (limited channels) and DVD; bathroom; veranda with barbecue and outdoor dining area. Two storey loft overlooking the garden, located close to facilities. One queen located on upper level with television, Foxtel (limited channels) and DVD; two single bunks located on lower level. Features air-conditioning; heating; full kitchen with stovetop, oven, microwave and fridge; lounge and dining area; TV, Foxtel and DVD; bathroom with bath; veranda with outdoor dining area. Spa villa located overlooking the gardens. One queen, one single and one single bunk. Features air-conditioning; heating; full kitchen with stovetop, convection microwave and fridge; lounge and dining area; television, Foxtel (limited channels) and DVD; bathroom with spa; washing machine; veranda with outdoor dining area. Garden view villa, close to barbecue facilities. One queen and two single bunks, television in main bedroom. Features air-conditioning; heating; kitchen with stovetop, convection microwave and fridge; lounge and dining area; bathroom; television, Foxtel (limited channels) and DVD; veranda with outdoor dining area. Spa villa located overlooking the ocean. Two queens and two single bunks. Features air-conditioning; heating; full kitchen with stovetop, convection microwave, fridge and dishwasher; lounge and dining area; television, Foxtel (limited channels) and DVD; two bathrooms, one with spa; washing machine; veranda with outdoor furniture and dining area. Two storey townhouse located overlooking the ocean and garden. One queen, one single and one single bunk. 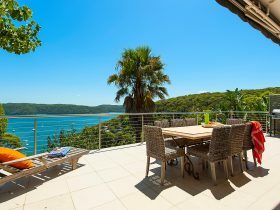 Features air-conditioning; heating; kitchen with stovetop, oven, microwave and dishwasher; lounge and dining; television, Foxtel (limited channels) and DVD, bathroom with spa; washing machine; balcony and veranda with outdoor dining area. Villa located overlooking the garden and situated close to resort facilities. One queen and two singles. 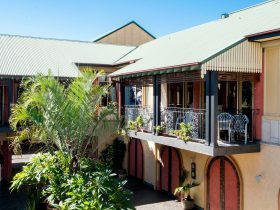 Features air- conditioning; heating; full kitchen with stovetop, convection microwave, fridge and dishwasher; lounge and dining area; television, Foxtel (limited channels) and DVD bathroom; veranda with outdoor dining area. Powered grass site with some mat and crushed granite slab sites available. Suitable for tent. 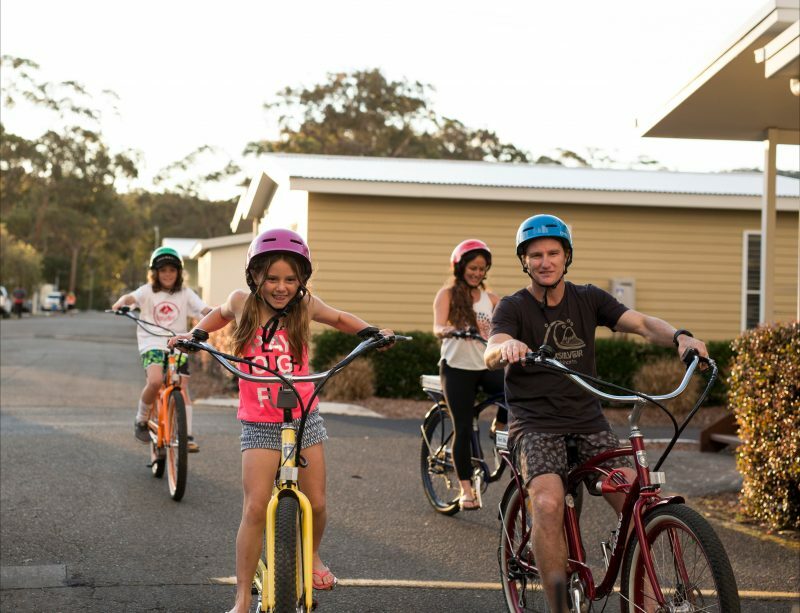 Located close to facilities including amenities, waterpark, barbecue area, pool and camp kitchen. Safari tent located overlooking the garden. Open plan. One queen and one single bunk. 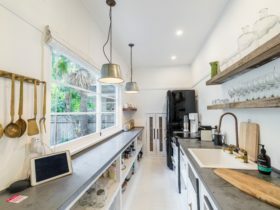 Features kitchenette with microwave and fridge; dining area; television, Foxtel (limited channels) and DVD; bathroom; veranda with barbecue (with sink) and outdoor dining area. Powered crushed granite slab site with annex mat suitable for caravan, motorhome, campervan and tent. Located close to park facilities including tennis courts, amenities, barbecue area and pool. Powered crushed granite or concrete site with annex mat with some mat sites available. Suitable for caravan, motorhome, campervan and tent. Located close to facilities including pool, amenities and camp kitchen. Private full ensuite, concrete slab or mat site. Suitable for caravan, motorhome and campervan. Located close to park facilities including pool, recreation room, café and amenities. Subject to change and availability. Prices vary depending on seasonality and accommodation types.